The Warrant Scam is back. Be aware of someone calling and pretending to be a San Diego County Sheriff's Department employee asking you for money in the form of gift cards. IT IS A SCAM. In recent days, we have received several calls from the public inquiring about these suspicious telephone calls. Your best response to this scam call is to HANG UP THE PHONE! No amount of discussion with the scammer will be worth your effort and you may actually give them information which could be used to separate you from your money! To sound believable, scammers will use a real Sheriff's employee's name or Sheriff's Department telephone number which can be found online. They will also use Caller ID "spoofing," which makes it appear as though the call is coming from a Sheriff's Station, Substation, facilities or court offices. They may also ask you to deliver the money to Sheriff's Headquarters at 9621 Ridgehaven Court in San Diego. 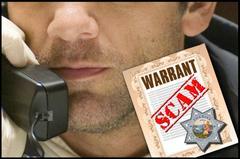 The caller will try to intimidate you and as a scare tactic will say: "You have a warrant out for your arrest. Pay up or you will end up in jail!" These scams play on your fears. You want to be a law abiding citizen and don't want to end up in jail. In a panic, you end up giving personal information or money to defuse the situation. RED FLAG: Phone + Money = Scam. If you receive a phone call and someone is asking for money, STOP! IT IS A SCAM. FACT: No employee of the Sheriff's Department will ever contact members of the public by telephone to demand money or any other form of payment. If you get this type of call, HANG UP IMMEDIATELY. FACT: Outstanding warrants cannot be resolved over the phone. Warrants can only be cleared through the court. People with outstanding warrants are encouraged to turn themselves in Monday through Friday during business hours at any one of the Sheriff's Court Facilities. For more information or to check if you have an outstanding warrant, visit: http://www.sdsheriff.net/courts/warrants.html.